Portrait of General Pitt Rivers. 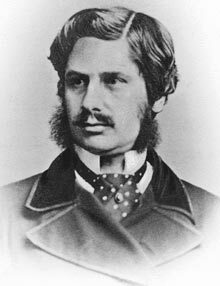 Lieutenant-General Augustus Henry Lane Fox Pitt Rivers was born in 1827 in Yorkshire to a wealthy land-owning family. In 1841 he entered the Royal Military Academy at Sandhurst and was commissioned into the Grenadier Guards in 1845. He fought for a short time in the Crimean War, and served in Malta, England, Canada and Ireland. He finally retired in 1882, at the age of 55, with the honorary rank of Lieutenant-General although he remained on the active list until 1896. Pitt Rivers married Alice Stanley in 1853, and had nine children. In 1880 Pitt Rivers unexpectedly inherited the Rivers estate and name from his great uncle. 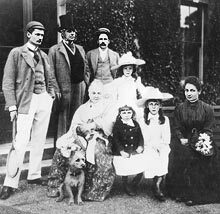 The country estate was a substantial one and he also received an annual income of a little under £20,000: for the remainder of his life he led the life of a wealthy landowner. In 1882 Pitt Rivers was appointed the first Inspector of Ancient Monuments and in 1881-2 he was President of the Anthropological Institute. He died in 1900, at the age of 73. Pitt Rivers' interest in collecting archaeological and ethnographic objects came out of his early professional interests in the history of firearms. It is generally believed that Pitt Rivers did little field collecting but, in fact, he did obtain a few objects whilst on active service, during a tour of Europe, in Malta and during the Crimean War. 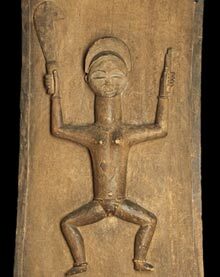 Although he collected some artefacts whilst 'in the field', the vast majority of objects in his collection came from dealers, auction houses, and from fellow members of the Anthropological Institute (such as E.H. Man, John Petherick, Richard Burton and E. Belcher). It is difficult to estimate the overall size of Pitt River's collection. Some 20,000 objects were donated to the Pitt Rivers Museum in 1884, but there was also a sizeable collection of objects displayed at his personal museum in Farnham, Dorset after this date. Pitt Rivers and family(w. Fox Pitt, General Pitt-Rivers, Hon. Mrs Pitt-Rivers, Douglas Fox Pitt, Mrs W.C. Scott And Children). Needless to say, attitudes to the objects and the intellectual basis upon which they are studied have changed since Pitt Rivers' collections were given to the University. Today the museum is still organised typologically but does not (and could not) show the supposed evolution of objects from the simple to the most complex. Archaeology became very important to Pitt Rivers; he purchased archaeological items from dealers and sale rooms, but also carried out excavations of his own, principally in Ireland during his service there in the 1860s, and in England (London, Yorkshire, Sussex and his own estates in Dorset). He documented his archaeological work fully, causing detailed site plans to be prepared and wooden models to be made. Pitt Rivers very soon exhausted the space available in his own house to show his collections. In 1873, he decided that his collection should be publicly exhibited and arranged with the South Kensington Museum to display around 10,000 objects at the Bethnal Green branch of that Museum. In 1878 his collection was moved to the South Kensington Museum. In 1880 he decided his collection should have a permanent home and eventually settled upon the University of Oxford. On 30 May 1882 the University accepted the offer of Pitt Rivers' collection; a three storey annexe, measuring approximately seventy by eighty-six feet, was built onto the eastern side of the University Museum (of Natural History) to house the collection. Henry Nottidge Moseley, Head of the Department of Zoology and Comparative Anatomy, was put in charge of the collection and Edward Burnett Tylor was appointed the first Lecturer in Anthropology in Britain. The University undertook to carry on Pitt Rivers' general method of arrangement of objects during his lifetime and agreed that "any changes in details ... shall be such only as are necessitated by the advance of knowledge". Although Pitt Rivers' original stipulations had suggested an on-going concern with his collection once it was given to Oxford, he did not display much interest in it, transferring that to his new museum in Farnham, Dorset. ... 1991. Pitt Rivers - The life and archaeological work of Lt. General Augustus Henry Lane Fox Pitt Rivers DCL FRS FSA . Cambridge University Press, Cambridge, UK. .... 2000 Coote, Jeremy; Chantal Knowles, Nicolette Meister, and Alison Petch 'Computerizing the Forster ('Cook'), Arawe, and Founding Collections at the Pitt Rivers Museum', Pacific Arts , nos. 19/20 (July), pp. 48-80.